Milan Kohout: 1996, TOBACCO FIELD ABOUT 50 MILES FROM HAVANA,"Illegal trip to Cuba"
1996, TOBACCO FIELD ABOUT 50 MILES FROM HAVANA,"Illegal trip to Cuba"
In March 1996 I "illegally" traveled to Cuba. During this "social reality study" trip I made a performance in the middle of the tobacco field (seen on the picture). 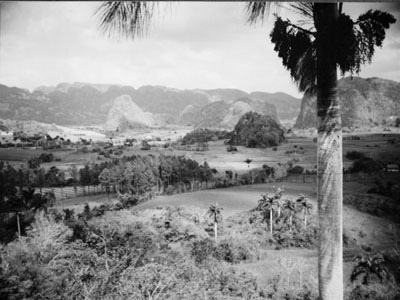 At this location I wrote spontaneously a poem reacting to the cuban "social reality" and buried it in the field. I expected that after some time it would be decomposed and the spirit of the poem (in molecules) would enter the underground water and would be eventually drunk by the locals. 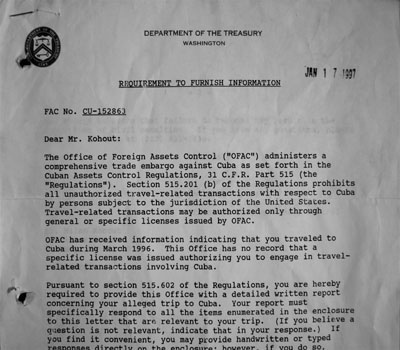 Following this trip on January 1997 I got a harassing letter from the US Department of the Treasury in Washington, threatening me with a jail term up to 10 years and penalty up to 250 thousand dollars for traveling to Cuba without a permit from the US government. I never responded to their totalitarian letter, and I have been expecting to be arrested or fined ever since. 2014, CAN YOU TELL ME WHICH CITY I AM IN?